Slab Seeker Spincast Combo: This special spincast combo reel is ultra light and easy to handle owing to its micro size. It comes with a 4-6″ lightweight 2 pcs Slab Sleeker rod with SLDLM reel and regular cork handle. These reels are specially designed with custom engineering ideas. The most interesting part of the Slab Sleeker range is the TAT which is the characteristic Tap Action Tips (the highly sensitive and fine tips) that can easily detect even the most subtle strikes on the bait. 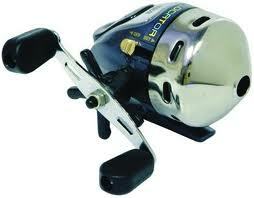 The reel is easily switched from left to right hand cranking. This gear is perfect for taking the fishing experience to new levels! This entry was posted on Monday, April 23rd, 2012 at 7:37 pm	and is filed under Fishing Equipment, Fishing Reels, Spincast Reel, Tips. You can follow any responses to this entry through the RSS 2.0 feed. You can skip to the end and leave a response. Pinging is currently not allowed.